Quite often that when you launch your Phone app for voice calling but realized that it is not opened in dialing pad. Instead, it can stay at Favorite, Recent calls, or Contacts depending on last state before it was closed. Even though it is just one step away, but how good would that be if you are able to be greeted by the dialing pad each and every time when the Phone app is launched. And that is how this simple tweak from Cydia is useful for. Named as StartDial, it will bring you to dialing pad whenever you launch you Phone app regardless of its last state which could be random. As usual, just go to Cydia (assuming that you have jailbreak your iPhone) and under the search tab, type in ‘StartDial’ will display the respective app ready for download. Simply download and install followed by a device restart will make it effective. Take note that there will be no new icon on your Springboard, but you should be able to find a new configuration under ‘Settings’ menu. Basically, not much configuration except the toggle switch that can turn it on and off. While it doesn’t seems to be very useful to average users, some especially those that would like to do quick dialing at any time will really appreciate it. Just imagine when you are driving on highway and would like to make a quick call, then this will definitely offer you great helping hand. 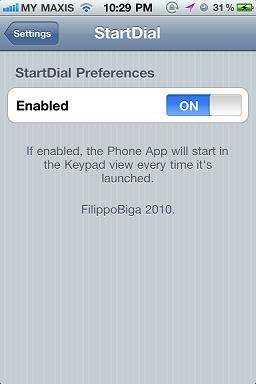 StartDial, which requires iOS 3.0 is available for free download in Cydia (by ModMyi.com).